Our 2nd annual Neighbor Helping Neighbor Walk held on Saturday, September 21st was a great success! We raised over $9,000 from the 100+ participants and supporters. An additional $6,200 in matching fundscame from Thrivent and 3 additional donors. A big thanks to everyone that helped us bring our final total to nearly $16,000. These funds will go directly to program services – Food, Infant Needs, Prescription Funding, and Transportation – for families in need in our local community. Over 40 HELP volunteers assisted at registration to greet participants and line the walking route with signs about the various roles they play in making Gaithersburg HELP a caring and important community organization. Walkers included Mayor Katz and Council Member Marraffa, youth from Identity, GHS Key Club, and WMHS Key Club and many community members. 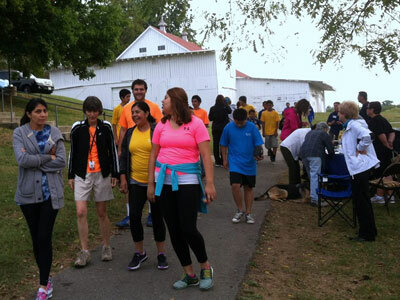 Participants learned more about HELP as they walked and talked with our volunteers. We would also like to thank Allicia’s Mexican Restaurant, Touchless Car Wash, Golden Bull Restaurant, and Thai Sisters for generous donations of raffle prizes.